Increasing competition for ratings and viewer engagement, the need to bring breaking news quickly, to go on the air from remote or unexpected places and provide unique shooting angles – all these have brought broadcast networks worldwide to extensively adopt wireless video transmission technologies. More and more camera teams benefit from using wireless equipment to transmit video content from cameras back to Outside Broadcast (OB) van or central stations. Both professionals and amateurs use wireless solution when they can’t use cables due to physical limitations and outdoor events or simply for enhanced convenience. Also, movie and reality show teams increasingly adopt wireless solutions for content monitoring by the director. All appreciate the value of wireless solutions for attractive content transmission and ease of video shooting. There is a variety of wireless technologies and solutions on the market today. This review of different wireless technologies clarifies their suitability to broadcasting today and the appropriate use for each. OFDM is a method of encoding digital data on multiple carrier frequencies. OFDM / COFDM based wireless video link systems consist of transmitters and receivers. The transmitter is positioned on the camera; the receiver is located inside the OB-van or at the event’s media center where the content is gathered and transmitted forward. OFDM-based solutions usually provide very high picture quality, performance and range, as they are “stand-alone” and don’t rely on other networks or equipment. In order to transmit the broadcast content to viewers. These systems typically belong to the high-end broadcast quality level. In wireless video links over cellular networks, the transmitter is positioned on the camera or in a backpack carried by the cameraman, transmitting the content over the cellular network and from there to the broadcaster’s servers. The receiver is usually a software on the server. Cellular systems often encounter congestion. In crowded events with many phone users, 3G & 4G networks may not provide the bandwidth required to maintain good image quality. Another typical problem is the high latency (up to 3 seconds) of the system. In video over WiFi systems. The transmitter is located on the camera and the receiver is either near the WiFi access point in the same location or at the TV station beyond the internet cloud. The main advantage of WiFi video link solutions is their low cost, making the a perfect choice for low-budget productions. The disadvantages are comprised picture quality and stability, crowded frequencies and the fact that they share resources with other applications and users. Combining two solutions can overcome some of these inherent technological limitations. For example when employing OFDM in a congested cellular environment, the OFDM link can be used to “jump” the first few hundred meters away from the cellular congestion. This solution enables the cellular transmitter to connect to a clear cell,far away from the event, avoiding congestion ad transmitting the braodcast live with minimal delay. ABonAir’s Broadcast transmission solution utilizes a robust OFDM technology to deliver professional broadcast quality and to guarantee wireless coverage even in the most difficult scenarios. 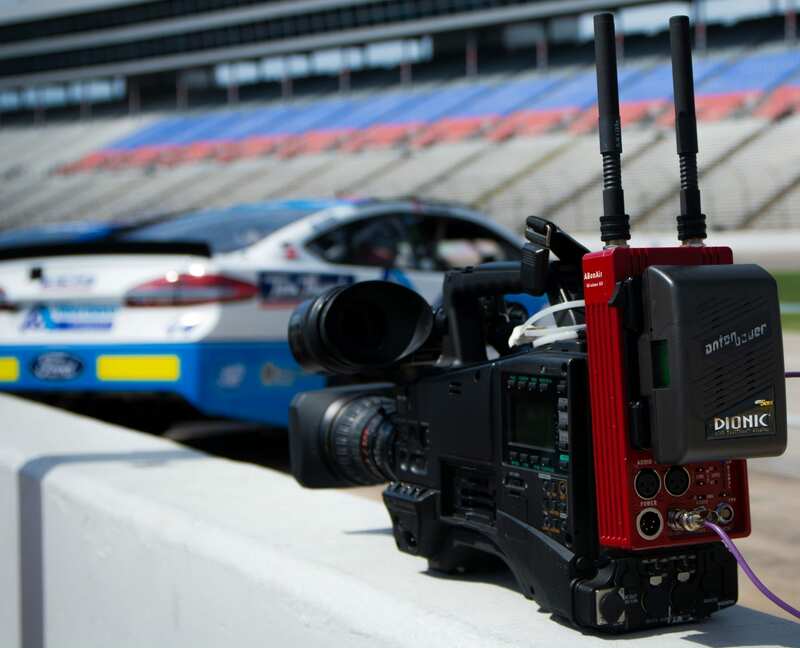 ABonAir innovative OFDM technology provides portable and high-quality video transmission systems from broadcast camera and production teams around the globe. This technology, combined with proprietary over-the-air protocol, was designed to stream HD and UHD video of the highest quality, with constant bitrates in order to meet the most demanding broadcast standards. Unlike high-end unidirectional systems. ABonAIr’s OFDM system is built on a bi-directional link between transmitter and receiver. This allows the system to acknowledge acceptance of each pixel, thus guaranteeing zero errors, accurate pictures, stable transmission and lower costs. In addition, the innovative video CODEC embedded in ABonAir’s systems, ensures excellent picture quality and range. Our state-of-the-art video compression technology, along with wireless radio enhancements (extended range, security and quality), is ideal for broadcasting market needs and requirements. The system’s unique algorithms are specifically designed to merge video and wireless technologies in order to deliver superior video quality, robustness and stability. ABonAir’s technology is based on full-duplex data channel that guarantees 100% availability with features such as range op to 3Km / 2 miles as well as extremely low delay (7 msec) and low power consumption. Thanks to it’s robust and reliable technology, ABonAir’s product line has been successfully employed by broadcasters around the world.